If they say they serve the best hamburger on highway 89 running through Utah, who am I to argue? Other than the fact that they're probably the only place that serves burgers on that highway, give 'em credit for their slick stab at marketing. All Co. and I had a chance to sample at the Prospector was plain java, pure and simple, and it did the job, even though it was probably 90F outside and non-ACed inside. Nice conversation with the locals inside, very enthusiastic to greet people from over there in France, and please, they implored us, would we take Obama back with us? Well, at least I know Willard has 5 votes guaranteed heading into the election next Tuesday. Some of the local farmers seemed pretty satisfied with the homemade pies, and one told us how upset she was with the French having taken her 'boy's medals.' I was getting a little nervous with the direction of this conversation, wondering if the French had somehow dissed an American soldier in Iraq. It turned out 'her boy' was Lance Armstrong, and we didn't bother trying to explain how it wasn't the French who took away the disgraced racer's titles, trying as we were to keep things at a genial tone and get back on the road without having to dodge any bullets. No, Prospector's wasn't one of the 'hits' of our summer tour of the US southwest, which is not to say it wasn't an interesting, albeit brief, visit. You've got to see Lake Powell once in a lifetime (not to brag, but this was our second visit), and although the Lake Powell Lodge, where we were staying, had a very satisfying breakfast buffet - tended over by a cadre of Romanian students working their way through a summer in the US - the dinner menu looked overpriced and sketchy. So we ventured into town, this being Page, AZ, where the choices are not many. We ended up with two more than adequate dinners at the ill-named Bonkers Restaurant at 810 North Navajo (tel. 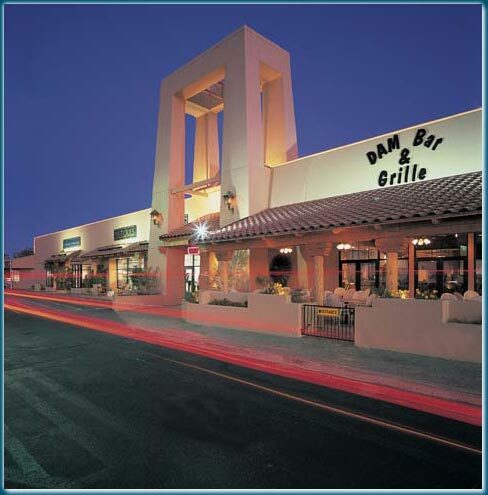 928-645-2706) and Dam Bar & Grille, located at the Dam Plaza,644 N. Navajo (tel. 928-645-2161). You are getting sleepy, you are getting sleepy... Sorry, I'm not talking to you, I'm just trying to hypnotize myself into remembering what I ate where, this being more than two months ago. I do remember a half-decent salad bar at Bonkers, and an extended barside conversation with a local at the Dam, who claimed to be the bar's reigning trivial contest king - there's some sort of contest running non-stop on a few of the TVs that circle overhead - although I kept one-upping him during the 20 minutes or so while we waited for our table on the terrace. So if you meet someone who claims to be the trivia king of Page, I wouldn't be too impressed if I were you. Bonkers and the Dam - these weren't 'hits' either, but as mentioned, they more than did the job. You don't go to Page for gourmet dining anyway, you go for the lake, so take them for what they are and you won't be dissatisfied. OK, time to get on to the good stuff, fast forwarding to Santa Fe, NM. Upwardly mobile as it is, Santa Fe is deceiving. At first glance, it looks like the ideal southwest US city - quaint, hip shops, tequilla drenched bars, cool adobe architecture. Then it hits you - the whole city is a bloody tourist trap. Even the Georgia O'Keefe museum was something of a bust. But, hey, that doesn't mean you can't eat well. 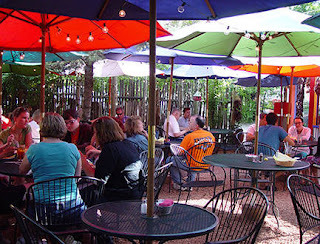 Just around the corner from our B&B (El Paradero) was one of Santa Fe's finest, Restaurant Martin (526 Galisteo Street, tel. 505-820-0919). That simply reeks with class. You also have to see Top Hat with Fred Astaire once in a lifetime - hell, make that many times - especially to watch Fred sing and dance his way through Irving Berlin's signature Top Hat, White Tie, and Tails. No, I didn't put on my top hat, but I did dust off my sports coat for Martin's. This is a venue with a good reputation and it lived up to its billing, with our tuna tartare, scallops, beef duo, chocolate ganache, and truffles selections, accompanied by a find $42 Syrah. At $152 before tip, this was one of the more pricey meals of our trip, but also one of the best. No question, Restaurant Martin was definitely a 'hit,' a venue that wouldn't be out of place in Paris. 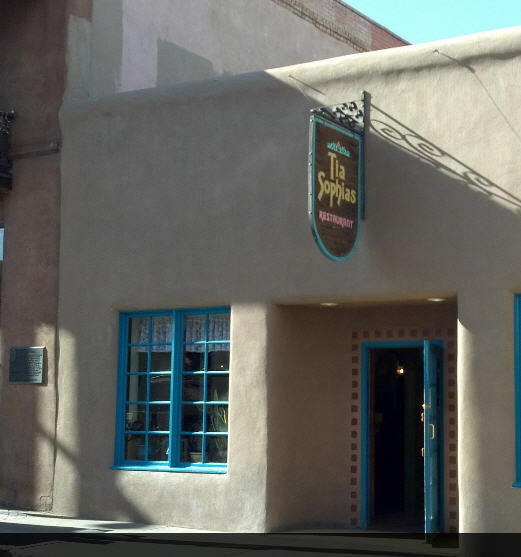 For the rest of our brief stay in Santa Fe, not much comes to mind except Tia Sophia's (210 W. San Francisco St., tel. 505-983-9880), a very good choice for a basic, satisfying Mexican lunch (see next photo below) - cheap and filling - and the Santa Fe institution, Cafe Pasqual's (121 Don Gaspar, tel. 505-983-9340) the latter of which has some cook books listed on amazon. 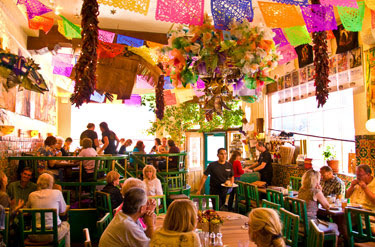 If you're going, no, not to San Francisco (St.), but to Pasqual's, you have to be prepared to wait, and wait we did, with plenty of time to peruse (and memorize) the menu. If it hadn't been so difficult trying to find a spot to down a few tequillas beforehand, it might not have been so bad. Actually, it wasn't so bad, our being seated in under a half hour. 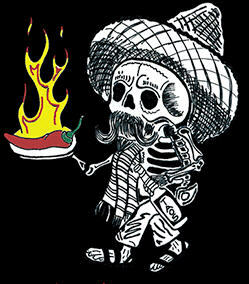 I still don't get the problems the family at the table to my right were having, but they seemed particularly upset that their dishes weren't hot enough (temperature, not spice) and that their main dishes included some of the same sides that were the focus of their appetizers. Had I been the waiter, I might have asked, 'then why did you order the same items, moron,' but then I am not nearly as diplomatic as the waitstaff at Pasqual's and their interest in getting a big tip. Well, I can't speak for the cranky patrons, but Co. and I certainly had an enjoyable meal. I guess Pasqual's fits the bill when it comes to nouvelle Mexican - the dishes were copious, creatively prepared, and pricey (the bill came to $97 with some conservative choices, especially on the alcohol front, where I went with a couple beers and Co. nursed a glass of sangria). Definitely a place to check out. The final two 'hits' come by way of the tiny town of Moab, Utah. Like Orlando's, Buck's Grill House and Vista Lounge sits along the main road, but unlike Orlando's does grace us with an actual address (1393 N. Highway 191, tel. 435-259-5201). Although Buck's name suggests a roadside greasy steak joint, it turned out to be a pleasant surprise, with a creative chef and some unexpected items on the menu, such as baby clams in broth ($11.95), duck tamales ($16.95), and a local bottle of Outlaw Red ($28). The second Moab 'hit,' the Desert Bistrot (36 S 100 W - yes, we're back in Utah with its obsession with having at least two cardinal points in each address, tel. 435-259-0756), was probably as close to Restaurant Martin we got in terms of realtively high-class dining on the trip. Once again, we found ourselves out on a secluded back patio, Co. getting her urgent yen for crab cakes (or at least a close facsimile as a crab cake muffin appetizer) and game, whereas I can't remember what I had except that it was pretty good. My one outstanding memory of the Desert had to do with Co. eschewing the more pricey game special, eland, for wapiti elk (or was it the other way around? ), yet the waitress ended up bringing the special instead of the dish Co. had ordered. Well, you would have thought our waitress was going to have a nervous breakdown. By the time she finished apologizing - actually, she never finished; I think somewhere out there in Moab, you will still hear her plaints - Co. got - belatedly - her wapiti and life moved on, only the waitress was pretty decent in comping Co.'s main dish, which cut down significantly on the bill, which nonetheless bordered on $100. Buck's actually broke the century mark, clocking in at $106 before tip. 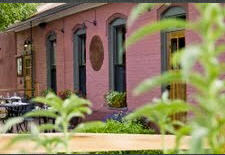 To finish up, the illustrious Cafe Diablo in Torrey, Utah (599 W. Main St., tel. 435-425-3070). Boasting an award-winning chef, I was psyched for something special, but ultimately disappointed. The chef apparently had numerous creative ideas, the only problem is they all ended up in the same plate, with the ultimate result being surprisingly 'bland.' Nonetheless, kudos for the superb rattlesnake cakes ($9) appetizer, made from no less than, no joke, actual free range desert rattlers, accompanied by ancho-rosemary aioli, one of my favorite dishes on the entire trip. Pure rattlesnake and tequilla - Yippie-ki-yea. Voila, there you have it - the 'hits.' It took two long entries, but it had to be done. If I can work up the enthusiasm without puking, I hope to add a third installment pertaining to the southwest US trip to focus on some big, fat 'misses,' one of which assuredly was one of the worst meals of my life. Something to look forward to, I'm sure, before we get back to down-home cooking in Paris. Hello. This post is likeable, and your blog is very interesting foods, congratulations!